Just when I thought I was done crying, Cozy’s ashes were delivered, after which I sat in the office with her and wept all over again. We couldn’t decide where to put her. I wanted to keep her close, since that’s all she ever wanted, but I knew that anywhere near where I sat and worked posed a risk of her being knocked over. We talked about putting her in the entertainment unit in the living room. She would be protected behind glass in there, but that wasn’t my Cozy. We decided to put her on the mantel in the family room. The family room is where I would sit and watch movies at night with Cozy either at my feet, in her favorite corner, or with her head in my lap begging for scritches. When it would get too hot from the fire she would go outside and lie on the patio, but always so she could see me. Guy Germaine, one of the more active members of Newf.Net, had posted many pictures of his woodworking skills. He had donated some wonderful creations to Newfoundland Rescue which were auctioned to raise money for their cause. 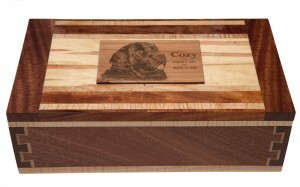 I contacted Guy and asked him to make me a special box for my Cozy. When I received the box, I was amazed at its quality and workmanship. Guy had outdone himself. The real eye-catcher though, was the image of Cozy engraved on the top. Guy had conspired with Annie Milliron, one of the Newf Net moderators at the time, to make the box special. Annie and Guy searched through some archived posts that I had made. 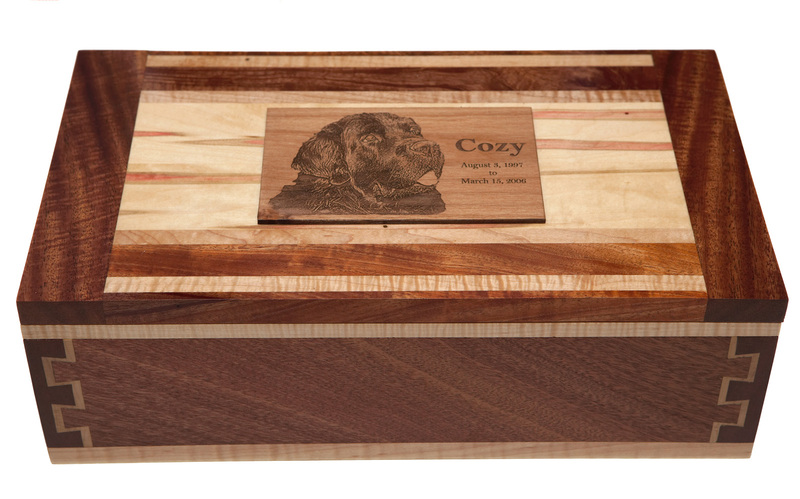 They found a wonderful picture of Cozy and had a copy laser engraved onto wood, which Guy then adhered to the top of the box. 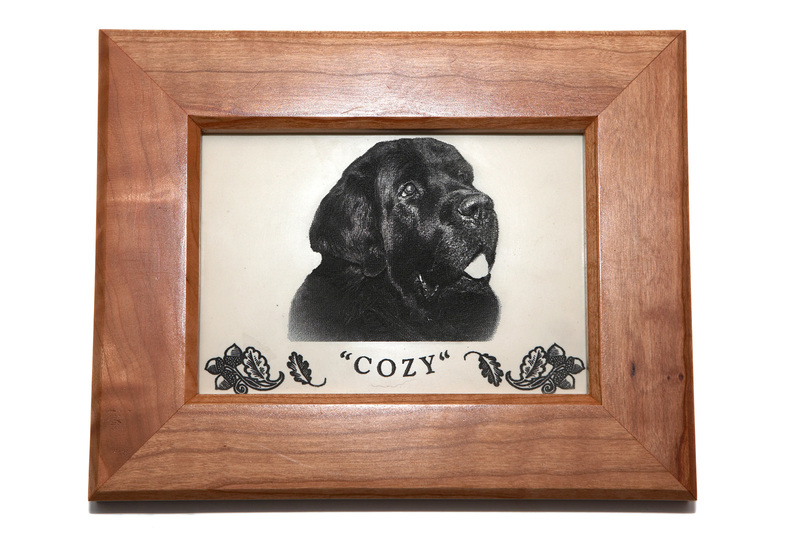 Next to the engraved image was Cozy’s name followed by her lifespan; August 3, 1997 to March 15, 2006. The box was beautiful beyond my expectations. That someone had felt so much for Cozy (and for me) that they would do this was beyond my comprehension. Two days later I received another box from Guy. He and I had talked briefly about fly fishing boxes, so I expected something in that vein. I could not have been more wrong. In the box was a framed tile. On the tile, the same picture of Cozy was etched with her name and some decoration on the bottom. The frame was beautiful, and obviously handmade. On the back of the frame, the tile was enclosed in wood, and there was an additional surprise. Guy and Annie had arranged for the framed tile to be at the annual Newf Net get-together. While there, the back of the frame had been signed by 25 Newf-Net members. On the bottom was written Newf.Net Get Together 2006. With the box open on my lap, I sat in my office, once again an emotional wreck. I have never been much of a “people person”, and here was proof that people from all over the country had come together because of me and because of my Cozy. These people had all been touched by my stories of Cozy, and they had come together to share in the love of their Newfoundland dogs. I had never before received such a gift. I was touched beyond words. I took the beautiful framed tile, photographed it, and hung it on my office wall in a special place, right under Cozy’s fractured paw print where it has remained one of my most cherished items. It is proof to me that there are good people in the world. One of the things that I regretted most was locking Cozy out of the office. Before we knew that she was sick I had put a gate up on the office door so she couldn’t get in due to my terrible allergies and it wasn’t until we knew she was going to die that I took the gate off. All she wanted was me and I pushed her away because of my allergies. I will never forgive myself for that. I had decided that the family room was not where Cozy would have wanted to be. I knew that she was our dog, and I knew the family room was our room, but dammit, other than for pizza and movie night, it was lonely in there. Cozy had always wanted to be in the office with me. With a great deal of reverence, and a fair bit of formality, I moved Cozy into my office on a shelf near my desk where she remains to this day. In the box with her is her precious Kong and her collar, still looped together as it was the day I took it from her neck that final time.